in Prime Carroll Gardens, Brooklyn w/ Convenient Office! Sitting on one of the prettiest blocks in Carroll Gardens, 410 Clinton Street is a gorgeous single-family townhouse with a professional space on the garden floor. An open floor plan, high ceilings, and over-sized windows create a feeling of depth and breadth. Stretch out and relax in the elegant, airy parlour floor, with its spacious dining room and unbroken sight lines. The master bedroom suite enjoys a walk-through dressing room with an entire wall of floor-to-ceiling closets. Original woodwork and new parquet floors beautify every level of this home. Zoned as a single-family home with a garden-level office space, and delivered vacant, this townhouse offers unparalleled flexibility. Easily renovate the garden level to create another 900+ square feet of living space. Alternatively, you can use the garden level as your own professional space, medical office or studio. You can also choose to rent out the garden/basement office duplex and enjoy high monthly income. 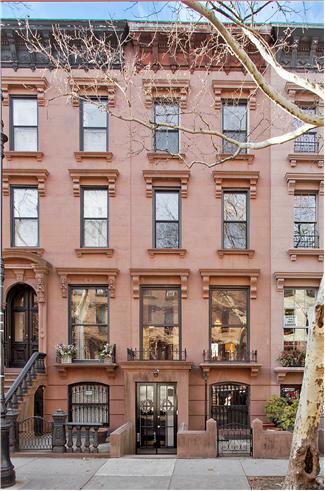 Brooklyn Heights townhouse for sale: Price Reduction!